Floor length, Empire waist, and what else? Anne Shirley? A summary of a Regency gown is like a list of what constitutes a good car. Past a few key items, it starts to become possible for variations too complicated for a simple post. I don’t know how I decided upon my version of the simplest summary of the elements key to a Regency gown. I suppose I read enough different accounts by others, then looked at enough fashion plates, paintings, and photos of actual museum pieces from the era and formed an opinion. That’s what you do when you buy a used car, right? Preferences figure into it, but there are only so many cars around, and we don’t hitch horses to them or fly them. I’m not an expert, but I’ve tried to learn as much as I can, and that’s what I’m passing on in this blog. A warning: I’ll overlook some construction details until later, since they won’t be found in a modern gown. Floor length. Surprise, surprise! Toes of shoes can be shown for early Regency; the entire shoe and even a bit of ankle in the late teens. 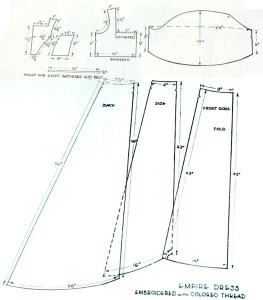 Fitted bodice (see neckline for different dresses below). 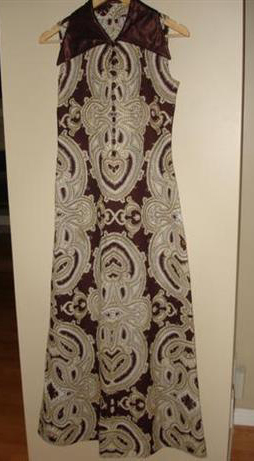 A ribbon or narrow panel of dress fabric may be added at the high waist. • Not fitted too close to the body’s curves. • Rectangular shaped front panel, sometimes with a slight flare at the hemline. • Front and sides fall straight to the floor, just large enough to skim past any wider parts. 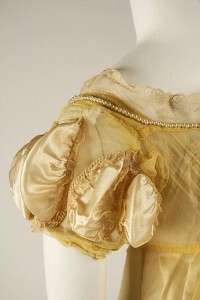 • Back may also be based on a flat rectangle but tends to be flared, sometimes into a slight train for early Regency. • Back is heavily gathered between the two diagonal back seams (back darts for a re-purposed gown) or full width. • No flounces; they didn’t come into vogue until into the 1820’s. • A slip dress with the above dress as a sheer overlay for a ball gown. • Robes that look like floor-length vests, worn over a plain gown. • Sleeves could be part of the overdress or the underdress. • Skirt overlays, if any, are never diagonal, draped, pleated, ruched, etc. • I love a puffed sleeve! It must be an Anne of Green Gables thing. After all, I had red braids until grade 3, when Mom had three little ones to get ready before she went to work. 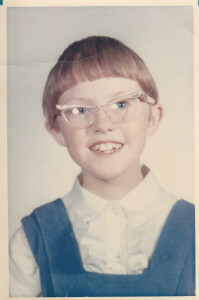 I got a Pixie cut and cat’s eye glasses that year! • It pleases me to say the most common shape in a Regency evening gown sleeve is a short, puffed sleeve with length to match the high waist, and a narrow cuff. • Sleeve puffs have gathers at top and bottom, and go straight out, not up or droopy. • Especially in the later Regency, ball gown sleeves had keyholes, insets, scallops, loops, layers, knots, bows, braiding, petals, piped fabric, self-covered buttons, beads, gemstones, etc., as well as ribbons, lace and embroidery! I’m out of breath reciting that list! • Short, straight, fitted sleeves or very short cap-like puffed sleeves were less common. Sheer, long Juliet sleeves were sometimes seen below the top puff. • Sleeves just to above the elbow with a slight puff, or straight and slightly wide (similar to the sleeve opening), are early 1800’s. • Very low cut in front and slightly low in back. • The opening is wide, to the point of almost no shoulder straps in some cases. 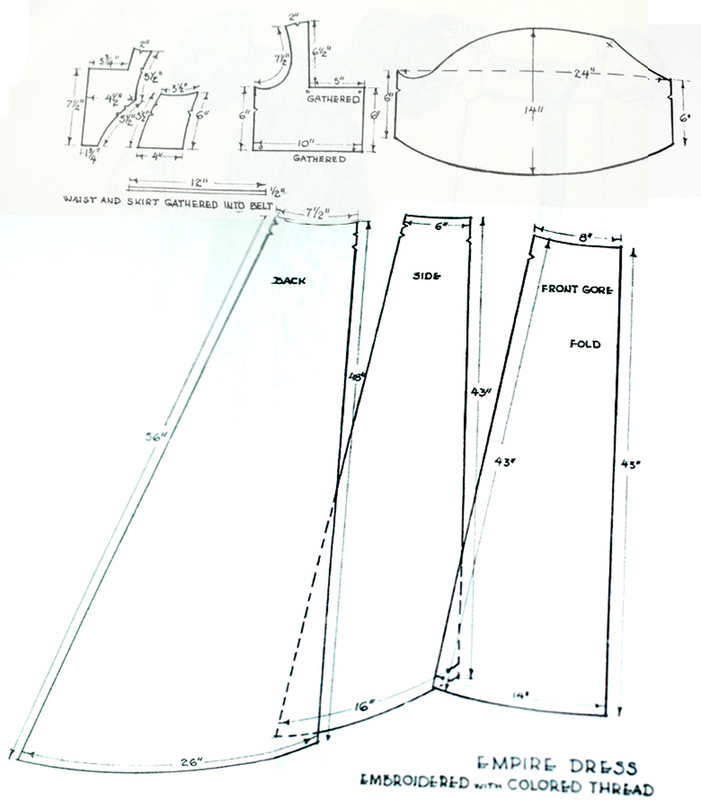 • Many shapes are acceptable for the top front bodice, but most common is square or near-square. Princess and halter are not seen. 1814 Swiss dotted morning gown, back view to show ties and gathers. • Most common is a Juliet sleeve: a long, straight, fitted sleeve to past the wrist, with a short, puffed sleeve over it (or a similar look). • Other styles for long sleeves may be peasant (long puffed top and bottom with cuff), fitted, or shirred (multiple puffs along the length). • Length can be ¾ to so long they scrunch up the arms and end at the base of the fingers. Bodice is simple and neckline is high: from a few inches from base of neck, to high-necked or, in the later teens, rows of ruffle up the neck. 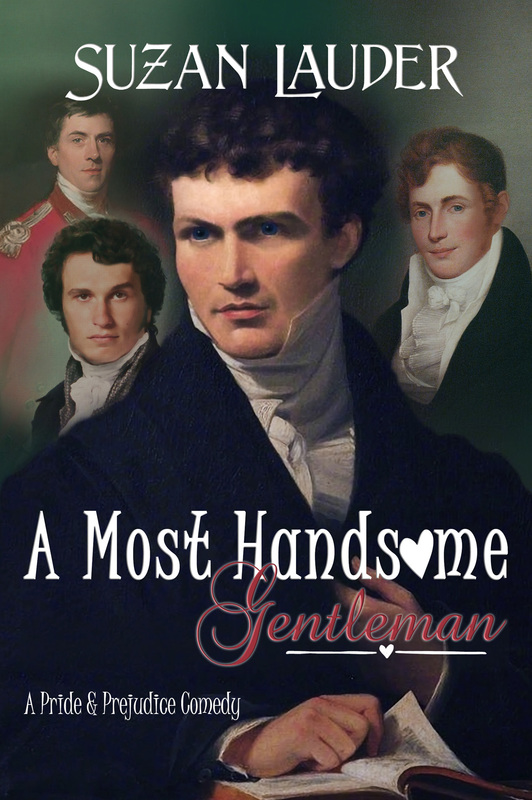 We’ll talk about “Regency dickies,” in a future post. • Fine, sheer or near sheer cottons and linens, gauze, voile, broadcloth, sari fabric (without heavy sequins), heavy but smooth silks, taffeta, organza, polyesters that look like silk or satin. Fine rayon may work to mimic muslin or silk. • Almost all colours were stylish at one time or another in 1811-1820, from vibrant to muted, earth tones, and lots of pink. Avoid black as it was solely for mourning. Lavender or grey were used for half-mourning, but also show up in fashion colour palettes. Obviously fluorescents are out of the question, but not acid green! • For day dresses, prints or embroidered patterns should be small and widely-spaced White-on-white was common, as was a coordinating print on colours. Avoid prints that scream modern. An article in “Jane Austen’s World” has some examples. • Some patterns work for a ball gown, but it’s safer to go one colour. White-on-white fine cottons or similar; or solid, rich-coloured silks. • Striped cottons for day wear; sheer striped overdresses or monotone stripes for ball gowns are fine. Stripes are always vertical on the skirt. • On the main field of the skirt, embroidery patterns were no more than a wide pattern of a small size. • More elaborate trim would be at or near the bottom border of the skirt, on short sleeves, and all over the bodice. • Does not have to match the gown, though that was common. • Trim was more obvious, and there was just more of it! • An optional line of trim down the centre front of the skirt. • Skirt bottom trim may be as wide as one foot, in large patterns. • May include large fabric flowers, ribbon, lace, embroidery, piping, chenille, Vandyke (triangular points), pleating (both horizontal and bound vertical), piping, ruching, beadwork, ball fringe, etc. • Knits, coarse cottons or linens, loud geometrics, fuzzy textures, obvious polyesters, leather, corduroy, raw or coarse silk (duponi), lamé. • Large prints, dark prints, animal prints, random geometrics, patchwork or multiple print panels. • Sewn-in details that would be hard to remove without leaving a shadow (e.g., long darts, long pin-tucks, studs) or without a lot of work (lots of sequins). • Large buttonhole fronts, either partway or all the way. • Lapels, cowl or boat necks. • Fitted and flared multi-panel skirts. This is the most common problem with modern empire gowns: there is not enough fabric for the gathers in back, even if you buy many sizes too large. You need lots of fabric in the bra line to waist area. • Pleated skirts, drop skirts, uneven skirt bottoms, flounces. • Ruching or draping of additional fabric on the skirt. If you can get beneath all this stuff, the dress usually is too fitted for the back gathers. Regency skirts are dead plain. Yes, they can have overlays, but they’re fairly simple until the hemline. • Avoid sleeveless. You can add sleeves, but it’s just as hard to find a puffed sleeve blouse as it is to find a puffed sleeve dress, and it’s ten times as hard when you’re trying to match them. • Halter bra or brief spaghetti strap bodices require not only sleeves, but shoulder straps and either an entire bodice or significant modification. If the skirt is not too closely fitted and has enough fabric for gathers behind, plus extra fabric or great details, it may be worth it, but it could be a huge sewing project. NEXT POST: ELEMENTS TO LOOK FOR WHEN SALVAGING A GOWN, AND THE GOWNS I’VE PURCHASED SO FAR! * Between the last decade of the 18th century and 1810, the line between skirt and bodice (“waistline”) of gowns rose from the natural waist to close under the bust and stayed high. The neckline dropped as well, so in the late 10’s, the bodice tended to be what Austen called “abbreviated.” The waistline dropped again in the early 20’s. There were exceptions during that period, but this blog will only focus on the high empire waist most characteristic of 1811-1820. ** Gathered-front gowns started to fall out of style by the late 1700’s, and by the Regency were uncommon. Even though most Regency gowns had a flat skirt front with the gathering behind, some examples can be found with gathers all around. This blog will focus on the flat-fronted gown, but recognize that if a gathered-front gown is found, it does not have to be made over. A follow-up to last week’s post: How to fit Regency corsets and stays, by the Oregon Regency Society. A Footnote: Lucy Maud Montgomery’s Anne Shirley wanted to become a writer, and so did I for most of my youth. Sometime in my teens, someone told me it would be too hard and would never pay the bills, and I was uncertain of my ability. My path took me down the road less traveled for a while, but I finally made the detour and came back around to the busy intersection where I belong! This entry was posted in Pretty Things, Regency Era Gowns, The Thrift Shop Regency Costume Experiment and tagged Bath Fashion Museum, Budget Regency Costume, JAFF meet-ups, Jane Austen, Jane Austen's World, JASNA, Louisville, Metropolitan Museum of Art, Oregon Regency Society, Parasol in a Ballroom, Regency, Regency Costume, Regency gown, Regency Unmentionables, Repurposed and upcycled fashion, The Thrift Shop Regency Costume Experiment, Thrifty Regency by Suzan Lauder. Bookmark the permalink.